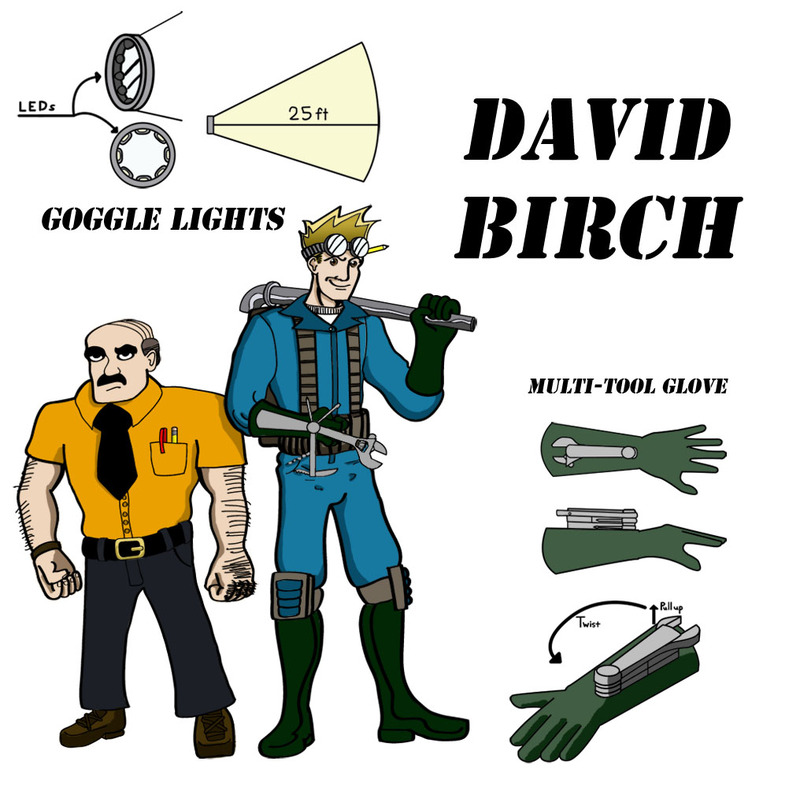 As a Freelance Sanitation and Maintenance Worker, David is in the employ of his Uncle Murphy, Director of Void City's Municipal Utilities, as a man of many talents to repair and maintain areas of the city that is too dangerous for regular workers to get to. Being several years out of graduate school from his alma matar Void City A&M, David has come across the one obstacle that could very well ruin his plans to create technology to better the condition of man: Unpaid College Loans. Needing money to pay the loans and then subsequently fund his own experiments, David has taken work from his Uncle in hopes that his abilities will at least be put to good use until he can pay off his debts and get back on track to his goal as well as uncover the many mysteries that lie below the streets of Void City, just waiting to be explored. David is generally a rather kind and well-meaning person whose only wish is that his work will one day be used for the betterment of mankind, but in the mean time he has a very slippery grasp on a lot of social interactions and generally is quite introverted in his want to talk with people. This, combined with his thought processes not matching with most people’s trains of thought he will often go off on tangents that don’t seem to be logical to anyone but him and generally an almost ditsy personality. But when pressed into dangerous and serious situations, David will drop any thought process and focus on the task at hand speaking very directly and with authority, especially if his skills are needed. David has fast hands and an even faster mental faculties and perceptions. Combined with a natural affinity towards constructing mechanical and electronic devices he can create devices of the most whimsical and ungainly sort depending on where he is and what is available to him. Complimenting his speed of hands is a pocket knife-like glove set upon a radial swivel for easy access to an arsenal of detachable tools. Everything from screwdrivers to metal sheers to wrenches are inside and made of light weight alloys that are easy to carry while still having a heft and toughness to them. In general, David keeps himself healthy and maintains a strong physique, though far from superhuman. He can at least handle opponents of the garden variety punk or thug and is fast enough to out run whatever might be chasing him. **To put in a simple way of saying: he is a mix of a McGuyver-like grease monkey and garage inventor with tendencies towards overly strange mechanical inventions. Has fast hands and a fast mind and is a bit of a ditsy genius a la The Doctor from Doctor Who. Is painfully inept outside of the inventing, repairing, adventuring, problem solving sort of situations, remaining awkward and weird from most others perceptions.